Precious metals advanced this week. 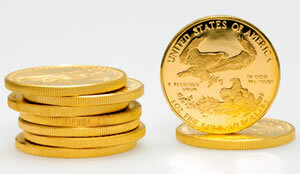 Sales of U.S. Mint bullion coins were also stronger. Gold logged a modest weekly gain as prices hit an early four-week low on Monday but then rebounded on Thursday with the biggest increase in three weeks. On Friday, Gold for August delivery slipped 80 cents to settle at $1,252.50 an ounce on the Comex division of the New York Mercantile Exchange. "The NFP [nonfarm payroll] was the most boring number ever but it does give one message out which is things are not getting worse regardless how you read that data," MarketWatch quoted Naeem Aslam, chief market analyst at AvaTrade. "This has triggered some selling pressure for gold but nothing as many thought because if we had a strong number today, the situation would have been very different." Nonfarm employment advanced a seasonally adjusted 217,000 last month, the U.S. Labor Department said on Friday. The jobless rate was unchanged at 6.3%, although the share of Americans participating in the labor force at 62.8% remains at the lowest level since the late 1970s. Gold prices advanced 0.5% for the week and are up 4.2% for the year to date. "Those who see weaker prices said the downtrend in gold continues despite a rally Thursday, following the European Central Bank meeting… Participants who look for higher prices said gold values in the short-term became oversold and the market is due for a bounce… Those who see prices holding sideways said with the two major news events out of the way, the ECB meeting and the May nonfarm payrolls report, there’s little to stir the market…"
Kitco News survey results last week showed gold forecasts that tallied to 18 down, 7 up and 2 sideways or are neutral. Snapping a four-session winning streak on Friday, silver for July delivery shed 9 cents, or 0.5%, to close at $18.99 an ounce. Still, the precious metal was the biggest gainer on the week with its 1.7% increase. The gain trimmed its year-to-date loss to 2%. July platinum tacked on $7.90, or 0.6%, to $1,453 an ounce, gaining 30 cents on the week. Palladium for September delivery added $4.80, or 0.6%, to $844.25 an ounce, rising 0.9% from a week ago. For the year so far, platinum has jumped 5.8% and palladium has soared 17.5%. For the week in London Fix prices, silver edged up 0.2% and palladium climbed 0.5% while gold dipped 0.2% and platinum fell 0.8%. Gold coin sales advanced 15,000 ounces after rising 10,500 ounces last week. Splits were 11,500 ounces in American Gold Eagles compared to 7,000 ounces previously and 3,500 ounces in American Gold Buffalos after 3,500 ounces previously. American Silver Eagles added 670,000 after the past two weekly gains of 300,000 and 426,500. The silver coins topped the year-to-date mark of 22 million on Tuesday with sales now at 22,106,500. Last year when the annual Silver Eagle sales record was hit at above 42.6 million, the coins had reached 22,550,500 by June 6, 2013. America the Beautiful Five Ounce Silver Bullion Coins gained 1,000, or 5,000 ounces, after rising 1,700, or 8,500 ounces last week. In the 12th full week of release following a five-year hiatus, American Platinum Eagles added 500 following a flat week. Below is a sales breakdown of U.S. Mint bullion products with columns listing the number of bullion coins sold on Friday, last week, this week and the month so far, last month, and the year-to-date. For a summary of performances last month, read about U.S. Mint bullion sales in May as well as Perth Mint bullion sales in May.